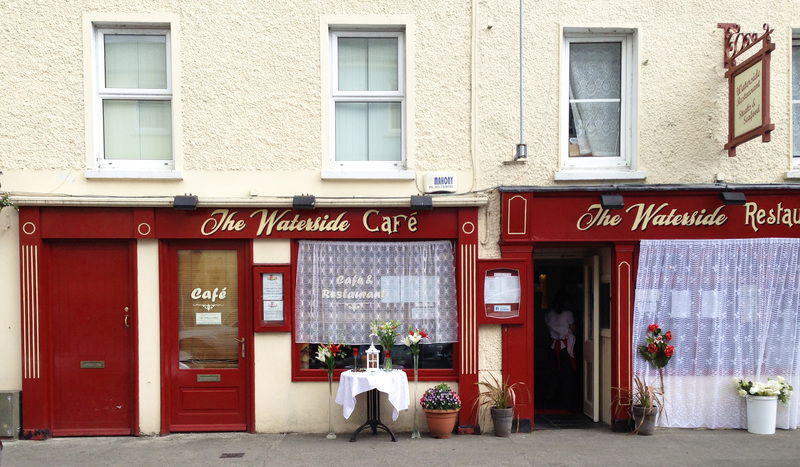 There were lace curtains across the doors – on the outside! 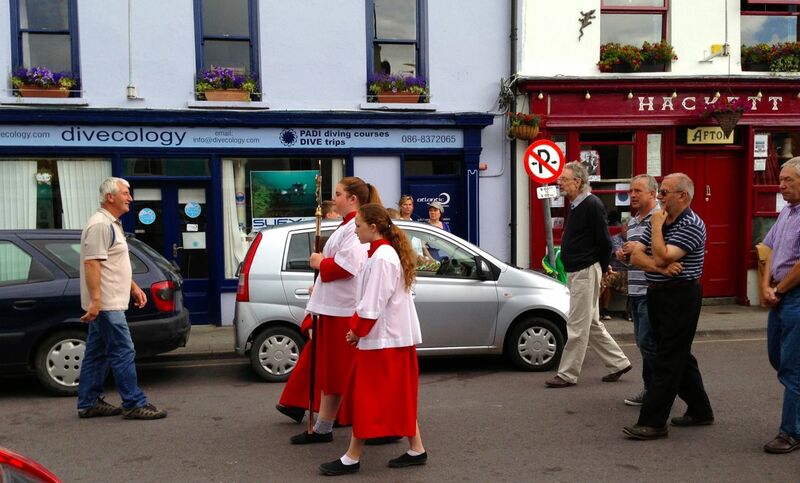 A new decorating fashion for Schull? It’s a trendy place you know. 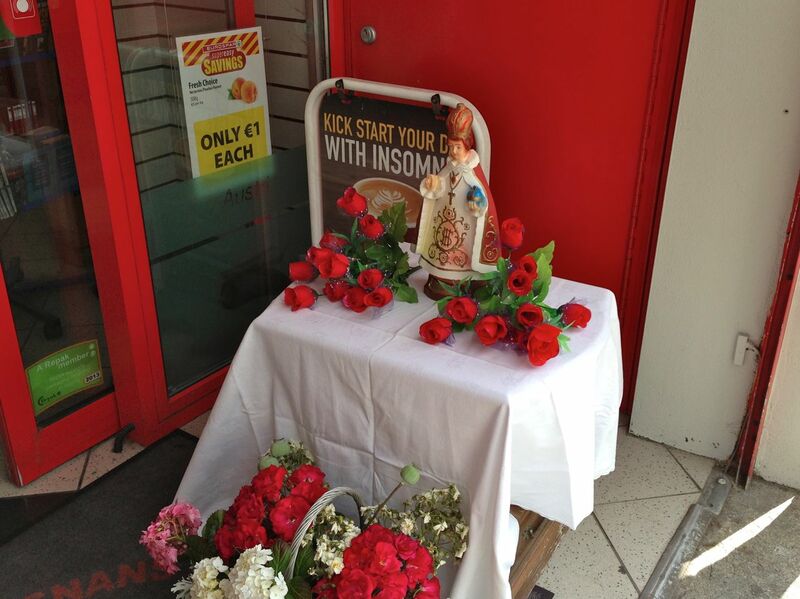 But also a table outside with flowers and an Infant Jesus of Prague statue on it… And similar treatments to shops and pubs all down the street. Aha! – Religious connections: is it a Saints Day? 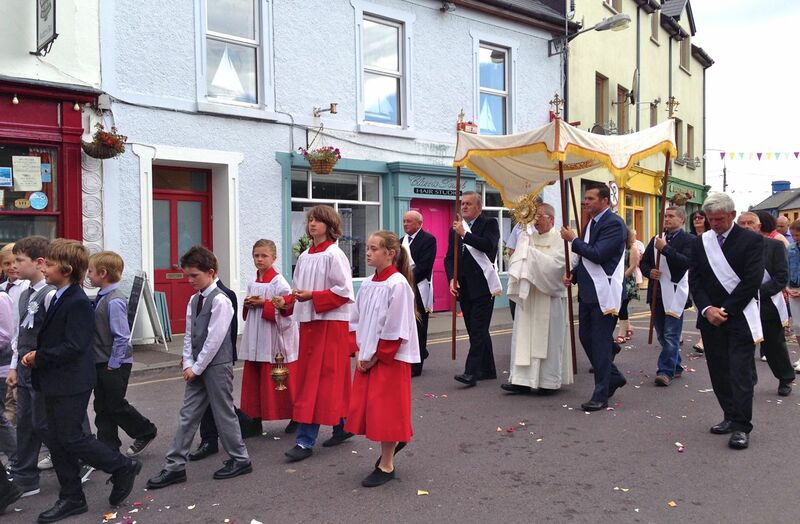 Well it is – by chance – St Peter’s Day, 29 June. But that’s not what this was all about. 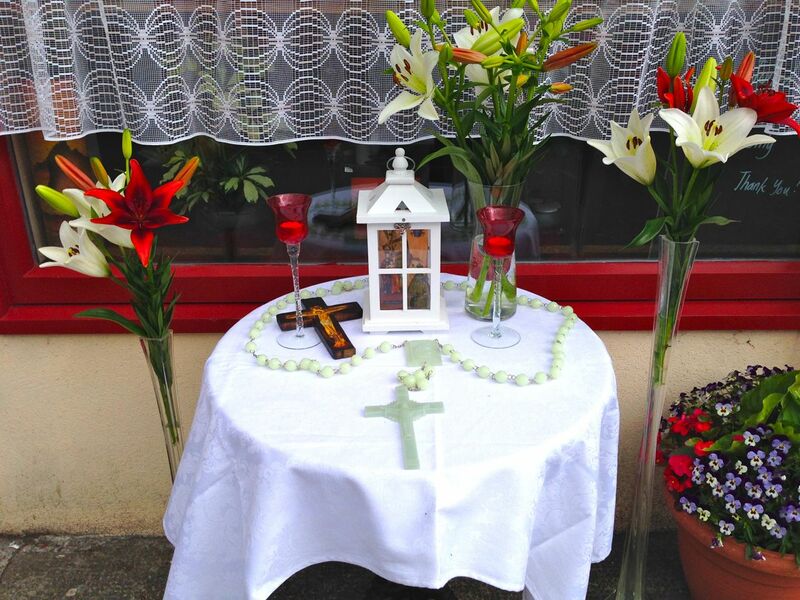 Simple: we asked someone on the street, and they told us that there was going to be the annual Corpus Christi procession. Oh! Isn’t that a big thing in other countries? 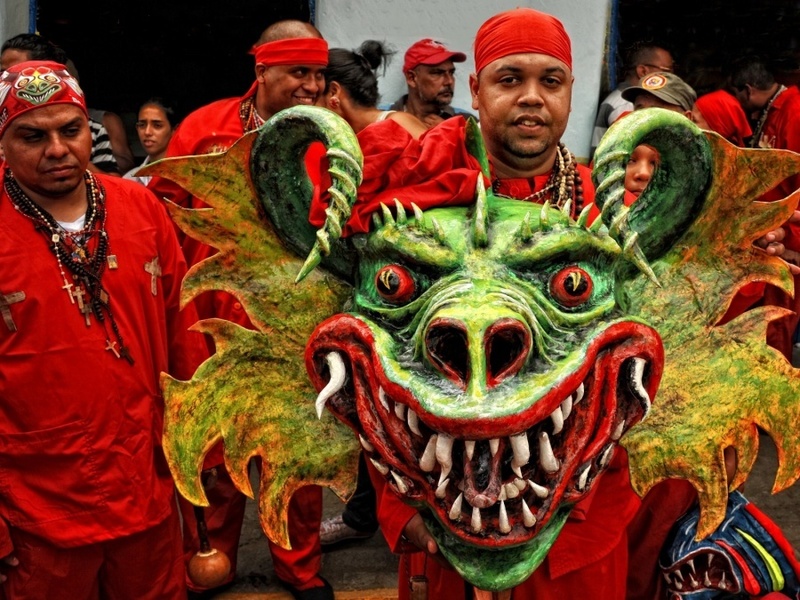 There are certainly some exotic examples – take a look at the Dancing Devils of Yare in Venuzuala… It is a custom originally frowned upon by the church as it seems to hark back to African pre-Christian roots. 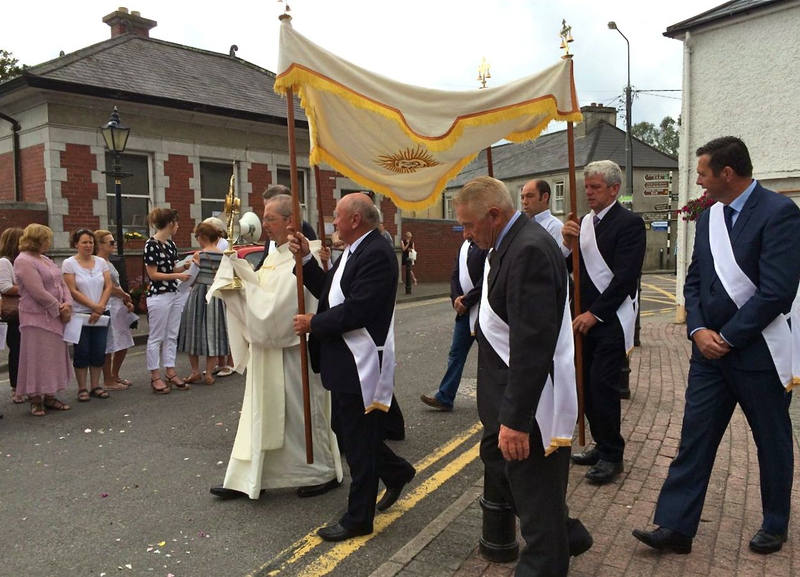 Now it’s brought into the church calendar and on Corpus Christi men dress up as devils, wage battle with each other, and then ‘surrender’ to the Eucharist and are blessed by the priest. 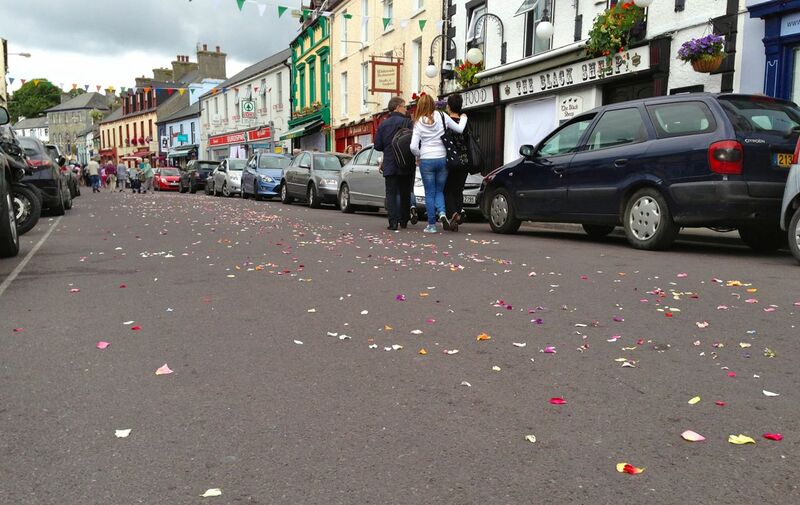 Anything like that in Schull? You’ll have to explain that to me. 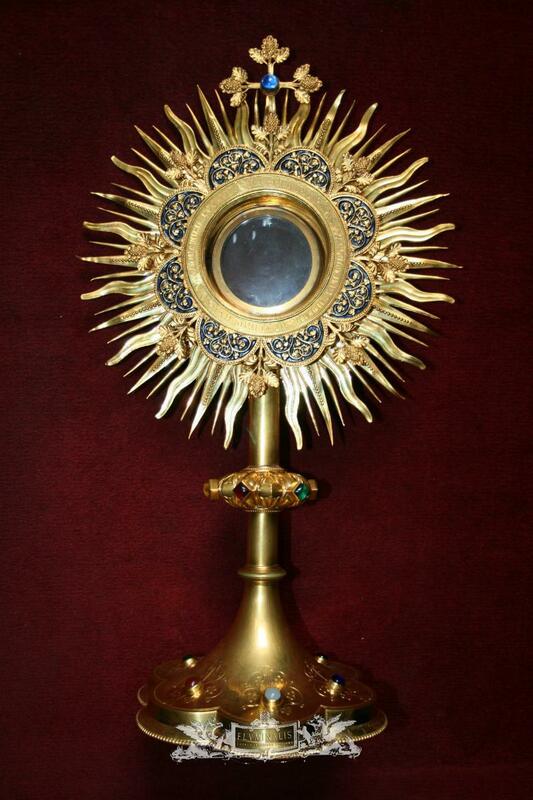 Monstrance – from the Latin monstrare – to show: it’s ‘…the vessel used in Roman Catholic, Old Catholic and Anglican churches to display the consecrated Eucharistic host during Eucharistic adoration or Benediction of the Blessed Sacrament…’ The symbolism is a sunburst, the source of all life, which in the Christian tradition is represented by the Body of Christ – Corpus Christi. Is all this rooted in something more ancient than Christianity? Well – apart from the sun symbolism – probably not. The feast was promulgated by Juliana of Liège, Belgium, who was born in the 13th century and became an Augustinian nun and, eventually, Prioress of her convent. She experienced a recurring vision of the bright full moon which was flawed by a dark spot or stripe. She believed that the moon symbolised the Church, which was flawed by the absence of a liturgical feast for the adoration of the Eucharist. She spent much of her life petitioning for such a festival but did not see her hopes realised: she died in 1258. 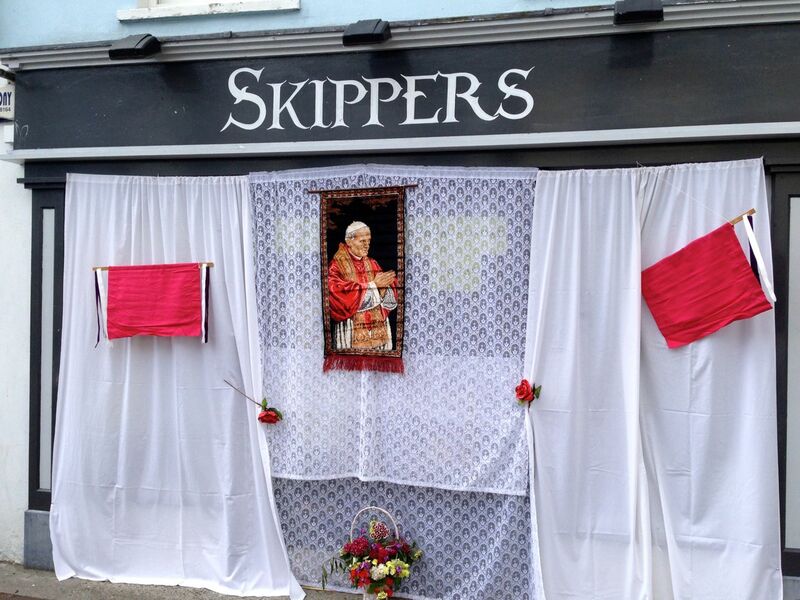 Her work was not in vain, however, as in 1264 Pope Urban IV instituted the feast of Corpus Christi. 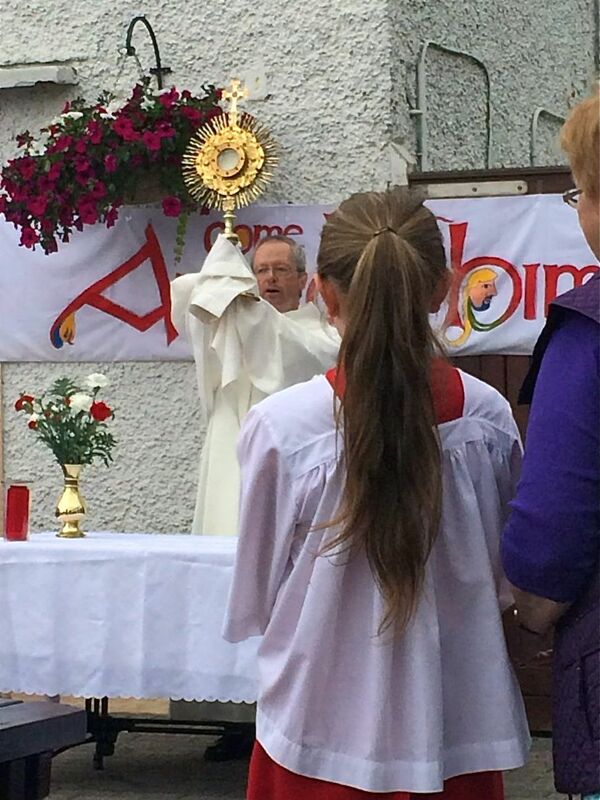 So this year sees the 750th anniversary of Corpus Christi? Yes it does. 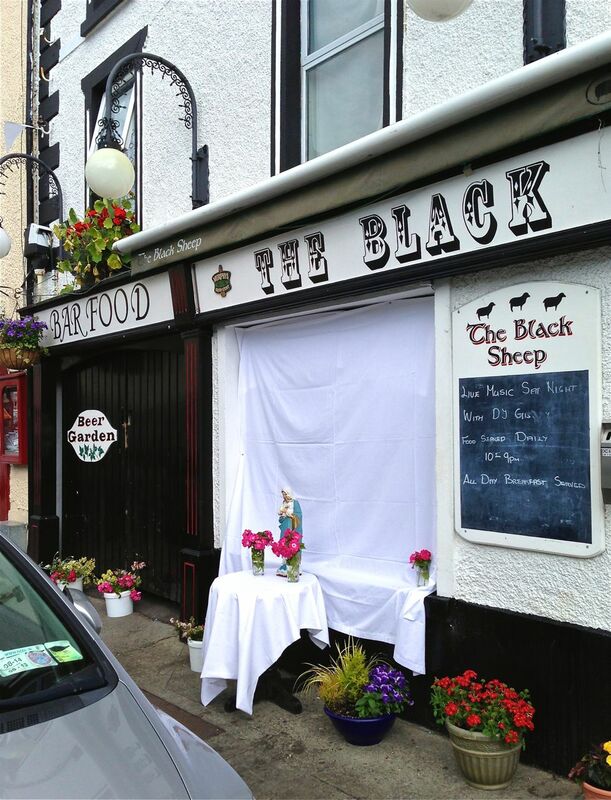 But it’s a movable feast, relating to the date of Easter – theoretically it should have occurred this year on 22 June but Schull obviously has other ideas. So it seems. 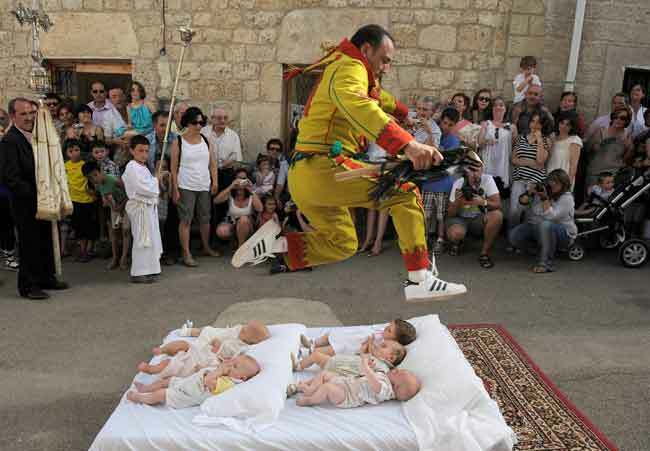 Now, I see you’ve called this post Baby Jumping…. You are very observant! 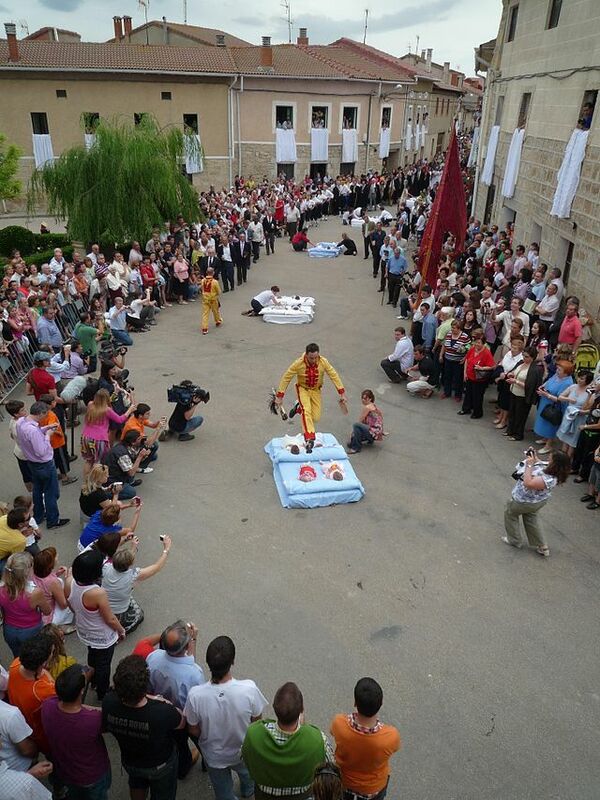 Well, I can’t resist mentioning this traditional Spanish holiday dating back to 1620 that takes place annually to celebrate Corpus Christi in the village of Castrillo de Murcia. 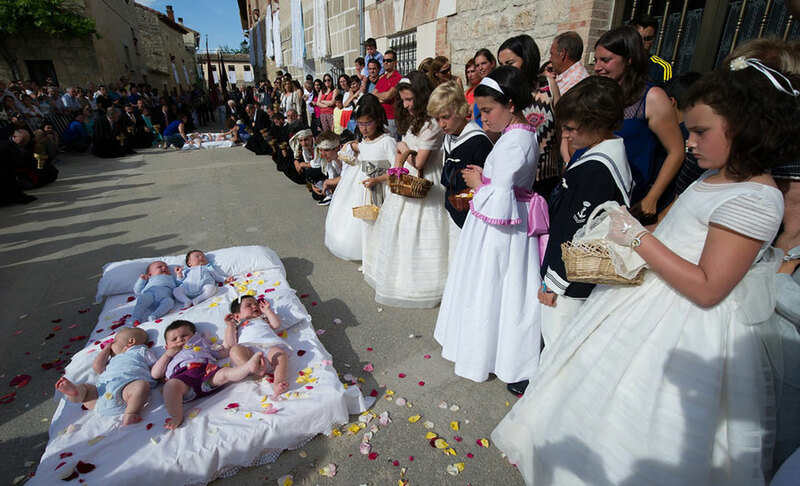 The custom is known as El Colacho, and men dressed up as devils jump over babies born during the previous year who are lying on mattresses in the street. 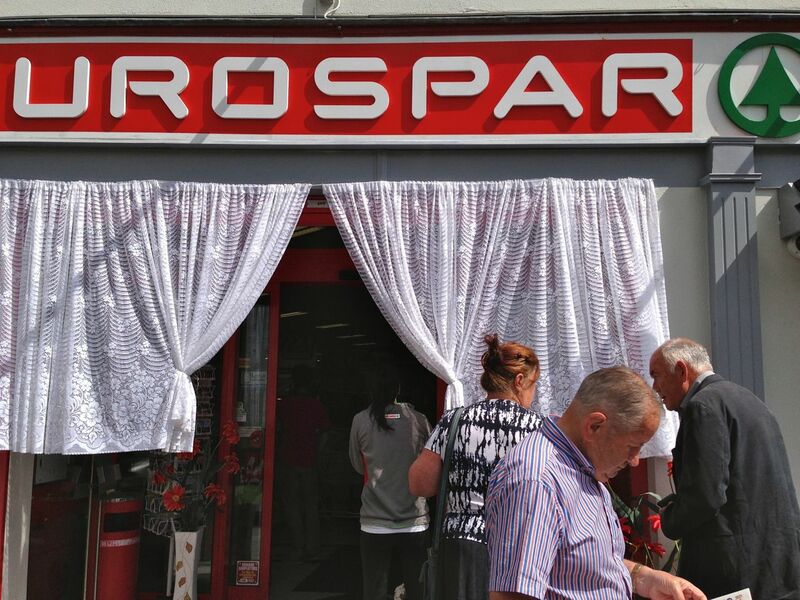 Something Schull could consider perhaps? Perhaps. But in the meantime have a look at this curious but highly entertaining Pathe News clip from 1941 showing a Corpus Christi procession in Bandon, not very far from here. 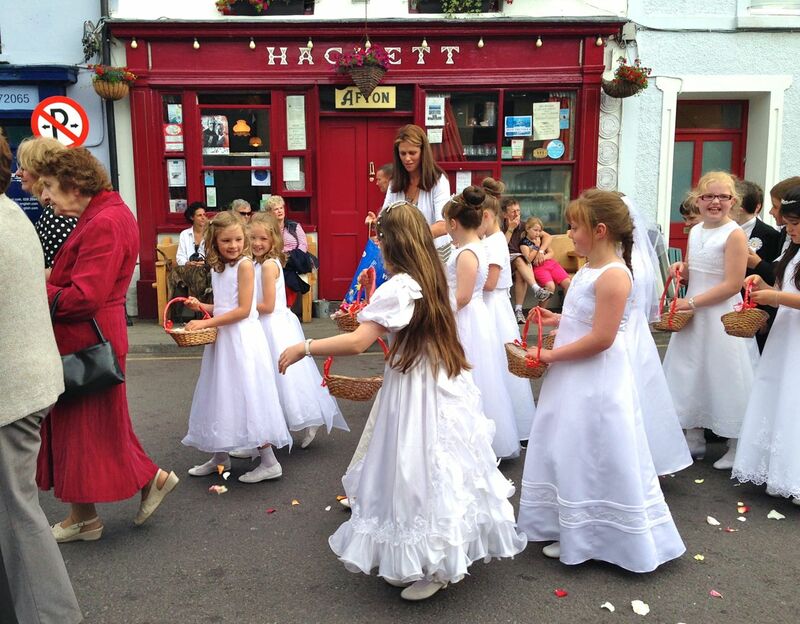 This entry was posted in Folklore, Irish History, Religion, Roaringwater Bay, Schull, West Cork, West Cork Blog and tagged Baby Jumping, Catholic Festivals, Corpus Christi, Corpus Christi Ireland, El Colacho, Irish Catholicism, Juliana of Liège, Monstrance, Pathe News, Schull Procession. Bookmark the permalink. Are spiked running shoes allowed? Thanks for explaining this tradition, I was wondering!